As I mentioned in the Baptism Cake post, this past Friday my brother-in-law flew in to offer a traditional Latin Mass during which our two daughters received their First Holy Communions! Afterwards we had a simple cake reception in the parish hall. For the girls' First Communion Cake I ordered Costco's Chocolate Cake with chocolate mousse and iced with white buttercream. (Normally I would have opted for the white cake, but I wanted to have a little variety, since the Baptism Cake was already white.) Since I wanted to make a white Bread of Life Cake Topper, using my Communion Candy Mold , I needed a contrasting color frosting to place it on. (I didn't think it would look that great placed on white frosting. 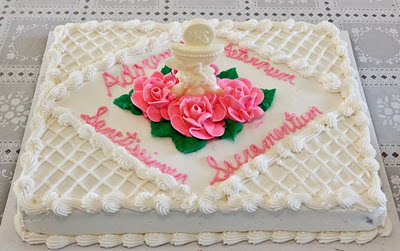 Originally I had planned to make my own cake for my daughter, frosting it soft-pink and placing the chalice on top, but since my options at Costco were limited to white or chocolate, I decided to have them decorate the cake with their "Bouquet" design (which is the same one I had chosen for our last First Communion) with Pink Roses and place the topper into the center of the roses standing up. Didn't it turn out pretty?! I also had them write "Adoremus in Aeternum Santissimum Sacramentum" which translates to "Let us for ever adore the Most Holy Sacrament." Now it is your turn. If you have made a cake for a First Holy Communion reception, we'd love to see it! Please add your link below. Oh you are so talented mother.They are so cute. I can't wait to see all of the lovely ideas form others entries. Our daughter will be making her 1st Communion in May so I will be taking notes! And Congratulations to your daughters on their 1st Communions and on your son's Baptism! 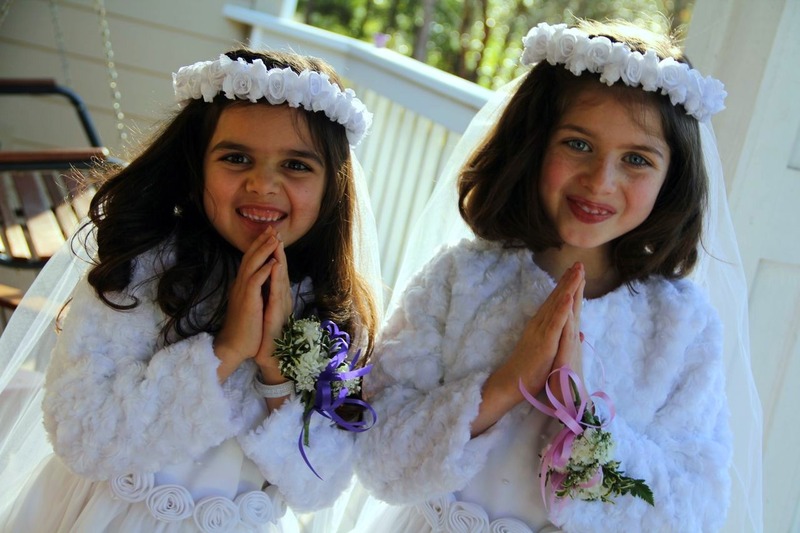 You have so many great ideas for celebrating Holy Communion!! Please link up your linky to the CeleLINKY thru the Sacraments. Congratulations Jessica!! Your girls look so happy! And that cake...lovely! Thank you for inviting us to link ours! What a beautiful day for all! The girls are beautiful. The cake is divine! Sorry for the double post. I'm new at blogging ;-). No problem! I will go ahead and remove one of them. Thank you for sharing! Thanks again for hosting this link up...it back some fun memories! I linked up my cookies since that is what I typically do for our celebrations. I also made a cake, but these cookies were what our special girl loved! And Congratulations to your beautiful girls! Wonderful! Your cookies are just lovely! What a beautiful and easy cake for such a special occasion. I truly enjoy all your wonderful ideas. Thank you! This is my first link-up- what fun and how easy! I love seeing others ideas and creations. Jessica, can we use the picture of your cake as a button? Thanks for the prompting, Xhonane! I had been meaning to make a button, and just hadn't done so yet. You can find it in the right sidebar. Thanks for participating in our link-up! Is there still a way to link up? I had so much fun making my daughter's cake! Hi Evie, Sorry it has taken me awhile to get back to you. My link-up account had expired, but I recently renewed it for a link-up at Shower of Roses so I went in and extended the dates on this link up for you. :) It will be open until my link-up account expires again on August 25th. I can't wait to see your daughter's cake!